At Little Monkeys Entertainment, we are focused on providing Soft Play Services with the highest levels of customer satisfaction and will do everything we can to meet your expectations. We are a Family run business based in Reigate. offering a relaxed environment where the children can play safely while the adults enjoy a nice hot drink with a slice of cake! Hiring out our equipment means you can have the same quality and clean soft play but in the comfort of your own home or chosen venue. 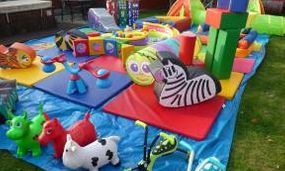 Little monkeys can offer you your own private party at our play groups venue on specific dates, please feel free to pop along and have a look around. We provide a high quality service using clean and suitable Soft Play equipment including Soft Play Pieces, Rockers, Mats, Ball Pool, Ride On's, Tunnels and much, much more. Our service specialises in fun for children up to the age of 5 years old. Creating a safe environment for the Children to have an amazing time. Giving any party a special dimension you wouldn't otherwise be able to attain. Allow your little one's imagination to run wild in a fun & safe environment. Our equipment encourages creative play, whilst helping with stimulation and imagination. Little monkeys have there own soft play group in reigate and also offer complete party packages with hall, sweet cones and decoration. Anything you may need help with we will do our upmost to cater for all your needs. Our full terms & conditions can be found on our site and can be emailed upon request. 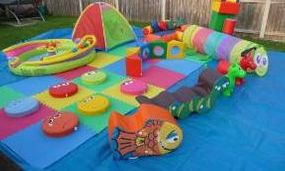 Little Monkeys Entertainment includes free Local Delivery, Set Up and Removal. Delivery is free to nearby locations within a 6 mile radius of reigate. Our equipment is safety approved and maintained. Any equipment which shows signs of wear and tear are immediately replaced. We guarantee that our equipment is clean knowing that hygiene is paramount. Our packages can be tailored to suit your personal needs and preferences, with a variety of offerings to choose from. We're sure you'll be happy working with us, and hope to see you again! Sign up to our Facebook and Twitter page to make sure you don't miss out on forthcoming offers and package updates. We have some very attractive packages and rates for you to choose from now, but we will also be asking for feedback from previous and potential customers to help grow our list of packages to meet the demands of customers and offer an exciting, personalised and special event for your loved ones. Our focus is to provide the most innovative and exciting events for your Children, giving them a day they'll never forget!